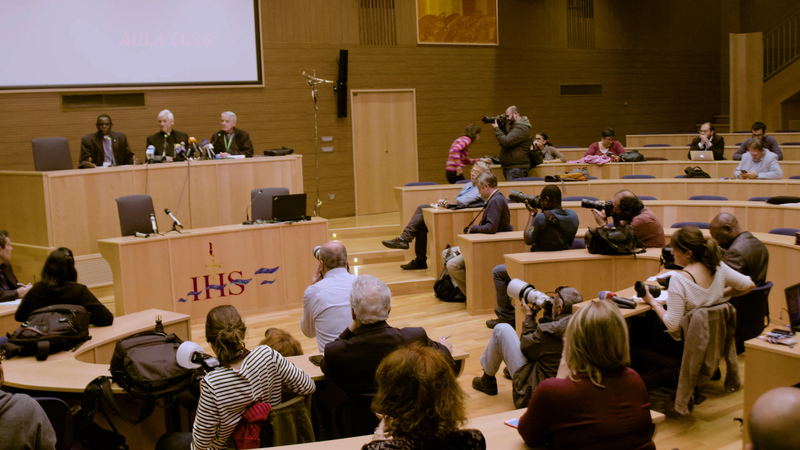 The top priority for Jesuits at this moment in history is “to work for reconciliation in the world,” Arturo Sosa, S.J., the new superior general of the Society of Jesus, said in Rome, Oct. 18, at his first press conference since his election. He revealed that this is “the call” that has come “from all regions of the world” in the consultation conducted over the past two years in preparation for the 36th General Congregation that is now underway at the Jesuit Curia in Rome. He described it as a call from “a world that feels split, divided and in which there is much violence and war.” All this is more visible in some countries like Syria, Iraq and Venezuela, but it is also happening in many other places that get little media attention. Together with economic factors and poverty, these conflicts lead to forced migration and open the door to human trafficking. “This is a call to help the world live in peace and harmony,” and Jesuits must respond to it, together with others, he stated. At the press conference, in the same hall where the 36th General Congregation is being held, Father Sosa emphasized that it is “most important” for Jesuits to have this intellectual depth because it is “one of the biggest services we can give to the church.” He drew attention to the fact that the Society of Jesus makes a major human resources investment in this field and is thus able to contribute to the church through its intellectual work and spiritual formation. This is an area he knows well; prior to his election, he was responsible for the Jesuits’ international houses in Rome: the Gregorian University, the Biblicum, the Orientale, and the Vatican Observatory. Before that, he helped reform a university in Venezuela. It is in the intellectual field too that Jesuits today are making a real contribution in mainland China, he said. About a dozen Jesuits are working there as professors in universities, teaching English and economics. The Chinese authorities are fully aware that they are Jesuits. In addition to this, he said, they are also engaged in theological and spiritual formation in Hong Kong, Macau and Taiwan. The hour-long press conference was chaired by Zambian-born Patrick Mulemi, S.J. and attended by media representatives from all over the world, including America’s Matt Malone, S.J., and Jeremy Zipple, S.J. The former director of the Vatican Press Office and advisor to Adolfo Nicolas, S.J., Federico Lombardi, S.J., presented the new superior general and recalled that they had first met at the 33rd General Congregation, which accepted Pedro Arrupe’s resignation and elected Peter-Hans Kolvenbach, S.J. Father Sosa was then the youngest delegate, and has participated in all general congregations since then. Although the past three superior generals had worked most of their lives in Asia, they were nonetheless European. Father Sosa is the first non-European and the first Latin American to head the order, Father Lombardi said. Asked about his relation to the first Jesuit pope, Father Sosa recalled that they too had first met at the 33rd General Congregation. “We sat facing each other,” he said, and they got to know each other during that month-and-a-half long congregation. They also met several times in Buenos Aires when the Venezuelan visited a social analysis center in the Argentine metropolis, while Bergoglio was bishop there. Since coming to Rome, Father Sosa revealed that he has met Pope Francis several times, including when he welcomed him to the international house when Francis visited the Gesù in September 2014. He received a phone call from the pope to congratulate him after his election, but he has yet to meet him face-to-face as superior general. In his presentation to the press before question time, Father Sosa had high praise for his predecessor, Adolfo Nicolàs, S.J. He sincerely thanked him for his “dedicated service” to the Society of Jesus and for the “very great friendship” they shared. He revealed that Father Nicolàs is now in Spain enjoying a well-deserved rest, but he said goodbye to Pope Francis and to Pope Emeritus Benedict XVI before departing. After his sojourn in Spain, Father Sosa said, his predecessor will return to the Philippines where he will continue to work, this time as spiritual father to the East Asian Pastoral Institute at the Ateneo de Manila, where he had worked for many years before his election to lead the Jesuits. “I am deeply touched by his freedom and his wish to continue working,” he said. Father Sosa was born in Caracas on Nov. 12, 1948, and has spent most of his life in Venezuela, where as a political scientist he taught in universities and worked in a social research center. It came as no surprise to him that some questions were related to his homeland and the dramatic political crisis there. He recalled that as a political scientist he had spent much time seeking to understand the socio-political situation in the country and the church’s role in it. He said it’s impossible to understand this situation without taking into account that the country lives on the money it gets from petroleum, and that this industry is managed exclusively by the state— a fact that weighs heavily on the democracy in the country. Both Hugo Chavez and Nicolàs Maduro ruled this way. The opposition thinks along the same lines regarding petroleum and the state. Consequently, Father Sosa said, “neither the government nor the opposition has a plan” to resolve the present crisis situation in the country. He believes that it is necessary “to build bridges” among all sectors of society so as to find a solution to the crisis, “because nobody wants any more violence in the country,” he said. The new superior general who is elected “for life,” told the press that many times since his election people have asked him how he will govern the society, and his response has been the same to everyone: “It’s not yet clear to me!” Indeed, he added, “it couldn’t be clear because the General Congregation—which is the supreme governing body of the Society of Jesus—is just beginning.” It will elect four assistants to help him in the government of the order and, based on the input given from the different provinces across the world over the past two years, they will discuss and decide the way ahead. Apart from the major task of working for reconciliation in the world, he expects it to continue to focus on refugees and poverty, and to give attention to the role of the international Jesuit houses that are based in Rome. What about the full reconciliation of man and woman in accordance with St John Paul II's Theology of the Body? As long as the original unity of man and woman is not restored, in the Church and in society, there can be no full reconciliation between humans, and between humans and nature. One way to start would be to ordain women to the diaconate, the priesthood, and the episcopate. Creating an order of Jesuit nuns would be helpful. I know one or two women who would make excellent Jesuit priests!